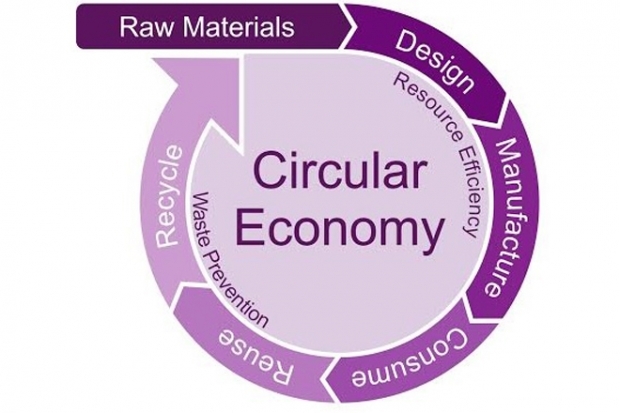 The journal Nature recently had an entire section devoted to the Circular Economy. It is a concept that is gaining currency, largely through the efforts of the Ellen MacArthur Foundation. In brief, it stands for a society with a minimum of waste. The grand vision is to decouple economic growth from resource consumption. If this seems like a tall order, it is. But that does not mean we ought not to set such an aspirational goal. When society is premised upon the continuum of take-make-use-refuse, then truly economic growth comes with the use of more resources. It begins with the resource in the ground, be it the metal for objects, gypsum for wall boards or petroleum for fuel or plastics. Energy, mostly derived from non-renewable fossil fuel, is used to make things. The produced goods are used, sometimes consumed and usually discarded as waste after the use. The circular economy seeks to minimize waste at each of the steps. Manufacturing today discards up to 90% of the raw material. Certainly, additive manufacturing (3D printing) will help where it can. But the design step before that is just as important. Most anything can be designed for repair, refurbish and re-use in general, or not. This underlines a key tenet of the concept. It is very much not only about recycling. Recycling is often very energy inefficient, while it does conserve hard resources such as metals. Besides, recycling requires the step of aggregation, and this is often uneconomic. The most successful model of recycling that I am aware of is that of lead from automotive batteries. The system made it happen. Folks were essentially given a discount on the new battery for returning the old one rather than discarding it. In states and provinces that do it, glass bottles have a deposit returned. One could argue whether the 5 cents drives behavior or not. But the principle is one worth emulating. A power drill returned for refurbish and subsequent sale, ought to have a value set on the return. But it would in the first place have been designed for economical refurbish. This underlines a key element of the circular economy: emphasis on repair, re-furbish and re-use in place of buying new. Expenditure on resources would be replaced with expenditure on labor. That means jobs. Plastics ought to be an area of emphasis. The vast bulk of them are derived from natural gas or oil. The US discards 35 million tons per year and either recycles or combusts only 14.3%. They almost symbolize the use and discard concept and are the poster children for economic growth being proportional to resource consumption. An estimated 100 million tons of the stuff is floating around in the oceans. Part of the problem is the variety of plastic formulations used and not necessarily sorted. Only two, PET (polyethylene terephthalate) and high density polyethylene are routinely recycled. The research emphasis has been on recycling, although those attempting to reduce the energy to recycle arguably are playing to the circular economy tune (one startup in the Triangle area). In the end it may not only be about technology. Business model change could drive behavior. If we went to more of a lease economy than buy and sell, the leasing entity would be advantaged by the equipment being maintainable and by it simply lasting longer. If they are also the manufacturers, they are positioned to design to achieve that result. Modern sensing and communication techniques would give them early warning for preventive maintenance. Similarly, sharing versus owning could play a part. The Airbnb model could be broadened to short term rentals of underused capital such as chain saws and party coolers (I know of a startup doing just that). Sophistication in data analytics, credit management and communications allows this sort of thing to be done cheaply. Who would have imagined five years ago that singers being paid $0.007 per Spotify play would seriously displace purchased (plastic) $20 CD’s? Most artists, other than Taylor Swift, seem to see it as a net positive. I have written often that reasonable atmospheric carbon dioxide targets can only be achieved by simply using less energy for the same utility. The circular economy concept is certainly in that song book. A great post. In the end it will come down to economics. Total recycle/repair costs (including aggregation) need to be close (hopefully less) than make-new for the model to catch on. Cost can be actual free market, or imposed, for instance by government as a tax on the raw materials, deposit (to move aggregation cost to the consumer), or subsidy of the recycle. Sometimes, as with wind and solar, a subsidy need only be temporary until a new technology reaches maturity and scale. Europe is imposing all three, the U.S. much less. Yes, it is all about the economics. Right now disposal is too cheap. Also, there is the matter of where the jobs are created. In a build, use, dispose model, build jobs are usually offshore. Repair and refurbish jobs would be domestic. In the end if dumping the microwave oven was made more expensive, things could change. It is an example of a device where to this day all the components are accessible, including the cavity magnetron. You are currently reading CIRCULAR REASONING at Research Triangle Energy Consortium.